Evesham has been supplying computers to the UK market since 1983. The company's Quest laptop series is powered by AMD processors, with the Quest Roma as its entry-level home entertainment model. It runs the Windows XP Media Center operating system for easy access to media files and applications. At 2.8kg, it's a semiportable machine with a spacious 15.4-inch widescreen display. The Super-TFT display has a glossy coating to enhance colour and contrast for watching DVDs and viewing digital photos. What sets this laptop apart is the use of powerful dedicated graphics. The ATi Mobility Radeon X700 graphics processor, sourcing 128MB of video memory, can handle the latest games and multimedia-intensive applications. A 3DMark score of 4776 puts it ahead of rivals by a wide margin. The Quest Roma wasn't as impressive in terms of general day-to-day performance. Fitted with an AMD Turion 64 MT-30 processor, running at 1.6GHz, and rounded out with 512MB of DDR memory, you'll find sufficient power for most tasks. There is also a 60GB hard drive for storing files. Performance was disappointing, with a MobileMark score of 145 placing this laptop last in the group. However, MobileMark doesn't take into account the 64-bit nature of this chip. It's suitable for basic computing, such as running office applications and surfing the Internet. As a machine designed to spend a considerable amount of time on a desktop, battery life isn't the top consideration. Indeed, the Quest Roma had the shortest mobile running time of the laptops on test at 146 minutes. This is a trade-off for the power-hungry graphics solution. Connectivity is comprehensive, with 10/100 Ethernet, Wi-Fi and Bluetooth in place, along with external monitor and SVideo outputs. Four USB ports and a Firewire port allow users to connect numerous peripherals. You'll also find there's a built-in memory card reader, and the dual-layer DVD writer will meet all your burning needs. 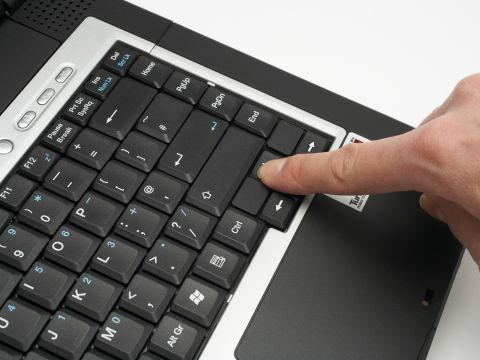 Users will also appreciate the full-size keyboard and responsive touchpad when working for long periods, although the keyboard sinks into the chassis in the lower right-hand corner and the keys rattle when typing. The software bundle includes CyberLink PowerDVD for watching videos, Roxio Easy Media Creator for burning, and BullGuard Anti-Virus to reduce the amount you need to budget for additional applications. It's surprising to find such powerful graphics at an entry-level price point, and this is the main selling point of the Evesham Quest Roma. The keyboard is disappointing and the lacklustre performance will deter power users, but those looking for a laptop for digital entertainment as well as day-to-day tasks will appreciate the use of the Windows XP Media Center operating system.